⦁ Non-chemical control is impractical for German cockroaches. ⦁ Whether by baits or contact insecticides, you have to kill cockroaches to get control. These days, non-chemical solutions to pest problems are all the rage. Through exclusion and habitat elimination, stored product pests, occasional invaders, and all sorts of small flies can be eliminated without firing a shot, as it were. So, why not German cockroaches (Blattella germanica)? What would a non-chemical solution for German cockroaches look like? Would an environment with little free water and no suitable harborage lead to a struggling population that couldn’t survive? Try to imagine a commercial kitchen with no free water. Between sweating cold water pipes and drains, there is always free water, even in the cleanest kitchens. And harborage? They harbor under counters, inside cabinets and even on cans and boxes in the pantry. It’s virtually impossible to seal every opening into wall voids. In heavy infestations, insect monitors may affect population size, but you’ll never get to zero. I’m sure there are instances where non-chemical elimination has been achieved, but these are highly controlled environments where clean, dry, harborage-free conditions are a priority. We need the force multiplier of a pesticide to eliminate cockroaches between service visits. Every night, they come out to explore for food, harborage and mates. As gregarious insects, they hang out together, using scent to tell them where the action is. We spend our time hunting them down, but they quickly learn which areas get regular attention and which are inaccessible. Both baits and contact insecticides can kill cockroaches. 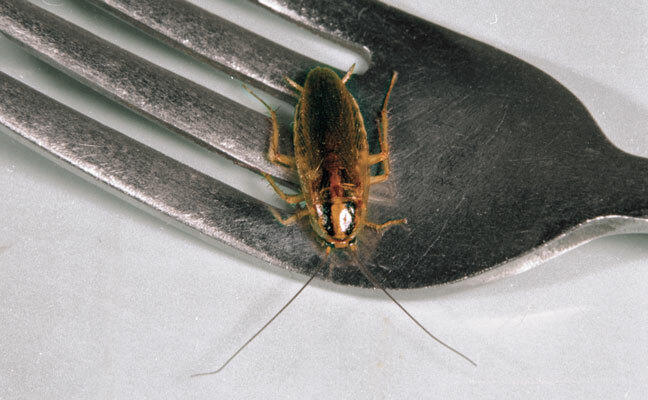 Baits: If the bait is accepted as food and placed where they encounter it, we will win because the cockroaches themselves make it happen. If the bait is poorly placed, contaminated, or the population is bait-averse, the cockroaches will multiply as if we were attempting non-chemical control. Contact insecticides: Whether synthetic, botanical or organic, effective insecticide use requires exposure to lethal doses. This means thorough applications and the use of non-repellent materials. Repellent materials have their place, especially if you want to lead the cockroaches away from one area and toward a treated area. The best results from these products come from a multi-pronged combination of dusts, sprayables and crack-and-crevice injection, as well as the use of insect growth regulators (IGRs). Don’t get me wrong; sanitation and harborage reduction are vital to cockroach control. As clean harborages and available food are limited, the cockroaches will travel farther every night to find them — and this increases their exposure to insect monitors, baits and contact insecticides. It is essential to gain as much cooperation as possible from the client, and always will be. But in the end, if you don’t kill them, they won’t go away.